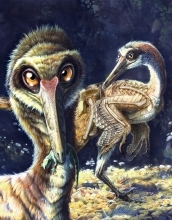 And speaking of dinosaurs, "Siberian Discovery Suggests Almost All Dinosaurs Were Feathered: Jurassic fossils may mean that feathers were all in the family." Comb jellies, it turns out, are a very early form of animal life. Before sponges first appeared -- sans neurons -- comb jellies had a nervous system. And speaking of the nervous system (with an excursion into physics, a major interest of mine), "Nanoparticles open a new window into the brain." Researchers at Stanford University in the US have developed the first non-invasive imaging technique that can detect micron-sized structures within blood vessels in the brains of mice. The method involves detecting near-infrared fluorescent light from single-walled carbon nanotubes (SWCNTs) that are injected into the mice. The ability to monitor the structure of blood vessels – and the blood flow within them – is extremely important for treating conditions such as strokes, dementia and brain tumours.